J – JOURNEY Our journey all starts from darkness to light when we become born again. Free from the guilt of sin, from darkness to light. What a great transformation for us, from death to eternal life. My life totally changed when I gave my life to the Lord in 1974 and what an exciting journey it has been ever since. E – EXPERIENCES We all have a story and what stories they can be! No-one I know has had the same walk that I have, everyone’s is different. Our tests need to become our testimonies, trials, our stepping stone or tomb stone. I know God can use all our experiences and walks for His glory. Somehow He always manages to turn ugliness into beauty and death into life. He uses our past to help someone’s future. S – SINGULAR We are all called individually to do something that God has specifically designed for each of us to do in this life. Yes, we belong to the body of Christ and yet we function individually with each of our gifting and call. Remember to walk in your gifting and not someone else. U – US We need each other regardless of what we think. We are a family, the family of God and families hangout together. Gathering is very important as we find strength, build faith and become accountable to one another. Ps 122:1 “I was glad when they said to me, Let us go to the house of the Lord.” There is blessings and peace there. S – SPLENDOR We have a hope and a future, both now and forever. We walk in the splendor of the earth and look forward to the majestic splendor of the heavens to come! Eternity is forever! 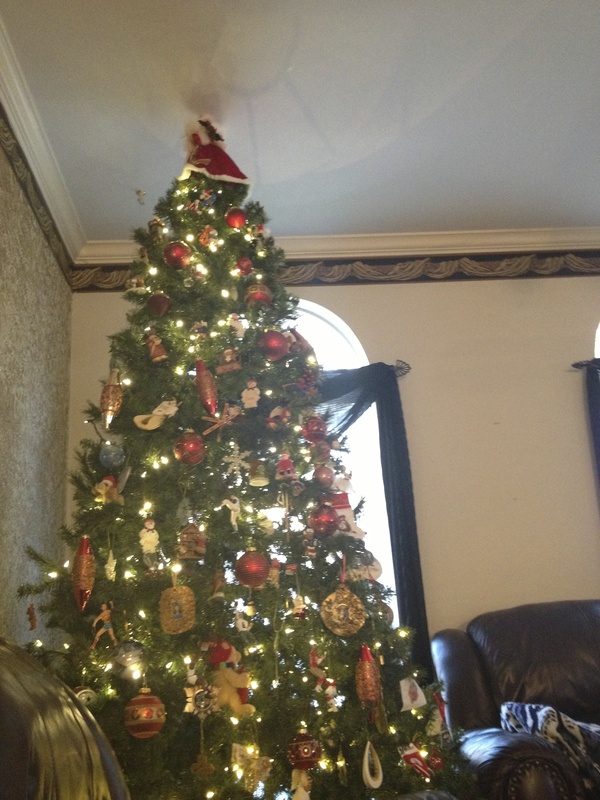 Christmas is coming….food, trees & games. We all have so many good ideas around this time of the year, celebrating the reason for the season, Jesus. Reading and seeing what everyone does inspired me to ask you a question or two. What would your ideal Christmas meal be? We always asked the whole family what meats they would like and we change every year. 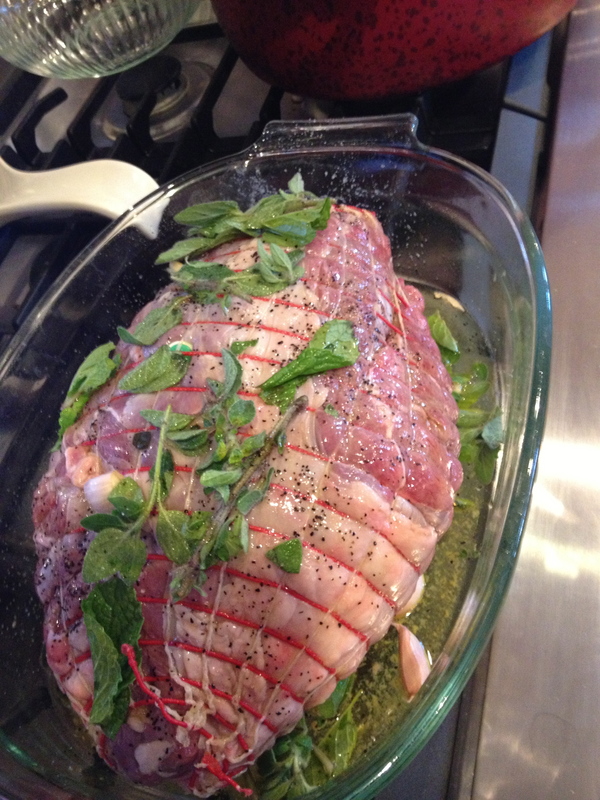 Lamb is always my favorite (Jeremy and I are the only two that eat it) with a ham, and a Cornish hen or two. The mashed potatoes, peas, sweet potato casserole, green bean casserole and let’s not forget the corn and trimmings. Dessert would be a trifle for me but no one in my house would eat it besides me, so we always go with the favorite chocolate chip cookies, pies and ice-cream! My hubby always wants a real tree but I win over in with this one as I really do not enjoy watering it and dealing with all the needles! My husband really just likes the smell so we usually purchase some real wreaths to hang in the house to help with that. What is your favorite board games to play with family and friends? Mexican Train, Sequence and Farkle of course! We love to play board games and everyone is really competitive so lots of fun is always had by all. 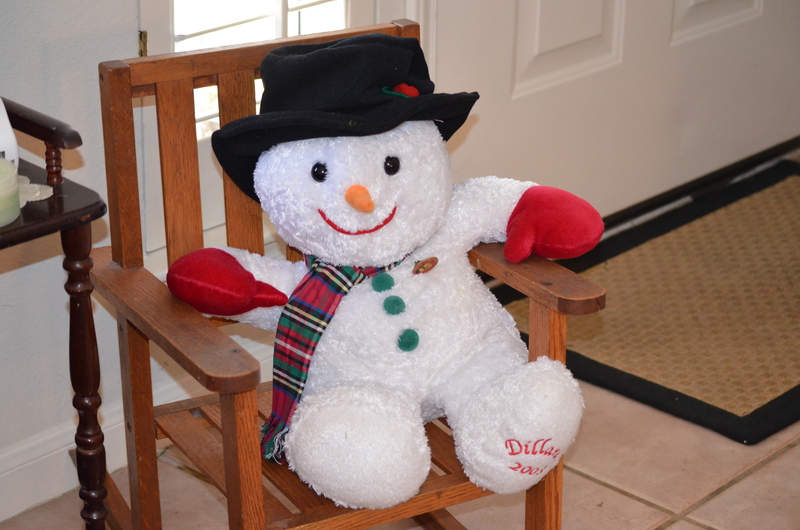 Frosty was won one year when we had a game of Bunko! We have now added Left, Right and Center which is a blast. Yes, it is that time of the year, tinsel, trees and celebrating the birth of our Savior. There has been a lot happening over the past three months. We celebrated Jasmines marriage, Charlotte came for a visit from England and the boys had lots of adventures in our backyard in their pool and playscape. My trip to South Africa was so much fun with lots of different activities. I was very spoiled with homemade karingmelk buskuit (buttermilk rusks) and coffee in bed every morning that my sister Linda made. Samantha, my niece Bronwyn’s daughter, performed in the play ‘Cats’ which was excellent. Rhys, my other niece Tracy’s son, braaied for us at their home which was delicious. Michael had a very successful trip to Lusaka, Zambia along with Rob and a great team. After arriving home it was time to celebrate August’s 4th birthday, with Peppa Pig and Chuck e Cheese, then off to Mexico on a cruise to celebrate the marriage of Shawn and Iris. Michael’s sister, Dayna, and her husband Gary, along with friends of ours, Steve and Pam Bostick, joined us ~ thus lots of fun was had by all especially seeing that both couples were on their first cruise ever 🙂 Two days after arriving home, I fell off a curb and broke my foot! Having a boot on for 6 weeks was no fun but helped slow life down a little which I secretly enjoyed…. August did a round of gymnastics and both he and Caleb started attending Mother’s Day Out with Kristen and have enjoy every minute of it. Thanksgiving and decorating is done and I love watching the awe and wonder as the grand babies experience such excitement and joy at this time of the year. Our annual visit to Wichita, Ks. was exciting as August had the time of his life driving the Corvette that Brad and Malinda bought for him. Last night we went to Burnet and walked through ‘The Town of Bethlehem’ with friends and thoroughly enjoyed the lights and finding baby Jesus. I can honestly say that it has been busy but I have enjoyed each and every minute of all the happenings. At this time of the year I love reflecting on the divine interruption that took place 2000 years ago on this earth, fulfilling prophecy, and giving us the hope of glory. He gave us a gift that goes on and on. I thank God daily for interrupting my life nearly 40 years ago. Oh my word, that makes me sound old but then again I do have kids that are 34, 29 and 25. God is awesome and so faithful ~ Thy Kingdom come, Thy will be done as it is in heaven. When little things get to us…. No matter how crazy our day has been today, we are still loved and cared for. We CALL Him and He ANSWERS ~ We TRUST Him and He is shows us the wonder of His LOVE ~ We ask for PROTECTION and He COVERS us, under the SHADOW of HIS WINGS ~ He KEEPS us as the apple of His eye, always WATCHING, LOVING and CARING. On Sunday evening, as August was leaving from a fun visit at our home, I saw him walking from side to side as he made his way to the car. I asked, “August what are you doing?” He answered, “Nana, my shadow is alway with me, look, see!” It immediately reminded me of walking under the Shadow of the Almighty, One who is always with us, keeps and covers us. Where can I go, where He is not? Life is a precious thing and we are so grateful for the journey that we walk daily. Here are a few updates for you in picture from seeing that I have not blogged for a while. Some highlights of Nate and Sarah’s wedding, grand kids and family. Enjoying Disney on Ice together. August and I at Flix. I was honored to help lead prayer for the community after losing Sgt. Hutch. Caleb on a date night with us. Sarah, Kristen and Tina hanging out. I wanted to share this as we had so much fun and wanted you to enjoy it too! Connie Kirk on Summer Picnic Time!